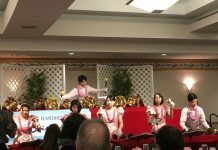 The Honolulu Japanese Chamber of Commerce celebrated the arrival of the ”Year of the Monkey” at its 71st annual shinnen enkai (New Year’s banquet). The Jan. 8 event at the Japanese Cultural Center of Hawai‘i attracted some 400 people, including HJCC members, their families and friends. 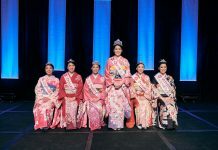 The 2015 Cherry Blossom Festival court greeted them at the Manoa Grand Ballroom entrance, where they could receive a Shintö blessing. The taiko group, Dragon Beat Hawai‘i , got the event off to an energetic start with a thunderous wadaiko performance. HJCC board chair Tyler Tokioka opened the formal program, which was emceed by 2015 Cherry Blossom Queen Sarah Kamida. Tokioka welcomed everyone to the event. 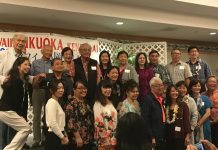 He acknowledged the evening’s performers and production crew; the shinnen enkai committee, chaired by member Steven Teruya; the Emperor and VIP table sponsors and guest chef DK Kodama of Sansei Seafood Restaurant & Sushi Bar. Bishop Daiya Amano of the Izumo Taishakyo Mission of Hawaii performed a traditional Shintö blessing and then offered the invocation before dinner. Freshly pounded mochi made by Konko Mission of Wahiawa members was among the dessert offerings. The kampai were offered by Consul General of Japan Yasushi Misawa and Nippon Club president Teiji Murayama. The audience was treated to Japanese classical dances performed by Hiromi Carlyle and Akemi Carlyle of the Hanayagi Dancing Academy Hawaii. Next articleHome Delivery: Ready, Set, Go!